Parties are hard work!! But they are also a labor of love, especially when Disney is involved. 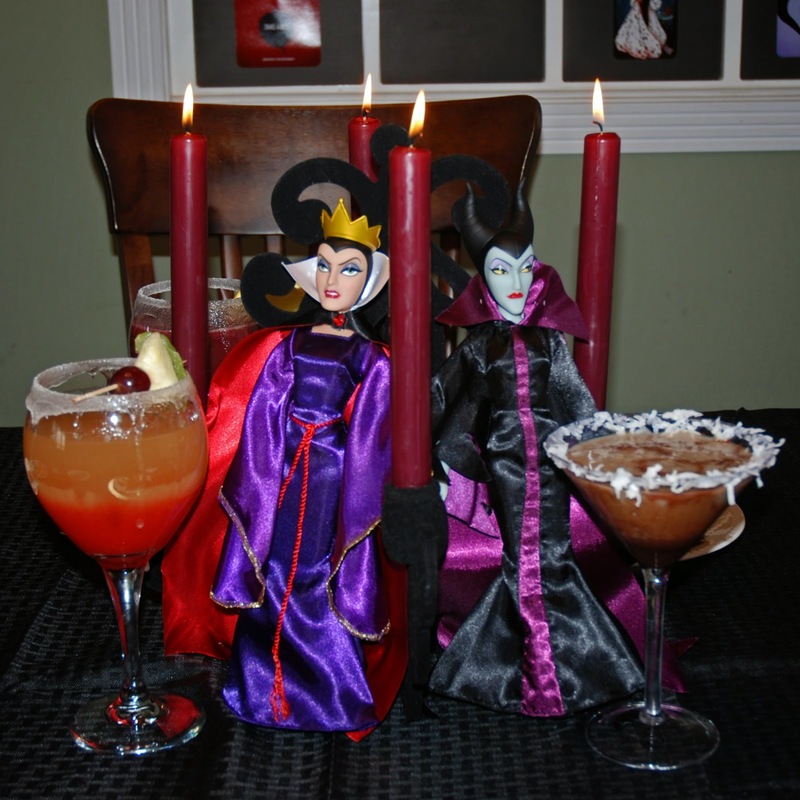 I featured Disney Villains at our #DisneySide @Home Celebration and decided to make a signature mocktail for some of my favorite evil cohorts. Fill the glass half way with pineapple juice. Fill almost to the top with gingerale. Add a splash of grenadine - don't mix so that you get the red to orange color effect. Garnish with a melon, pineapple, grape skewer. Cocktail version - add a shot of your favorite white liquor (gin, vodka, rum) or Peach Schnapp's. OK, I have to be honest here, I bought a bottle of Starbucks Mocha Frappuccino - but I do get credit for embellishment don't I?? Dip the rim of your glass in corn syrup, them sweetened, shredded coconut. Swirl the inside of the glass with Hershey's Dark Chocolate Syrup. Fill the glass with Starbucks Mocha Frappuccino. Cocktail version - use Kahula instead of the Hershey's Dark Chocolate Syrup. Add 2 cups of water with 4 large plums and 2 tablespoons of sugar to a pan and cook over medium heat until it comes to a boil. Set aside to cool. Dip the rim of your glass in corn syrup, then salt - fill with ice. Put a splash of grenadine in the bottom of your glass. Add 2 tablespoons of lemon juice to the glass. Place plum mixture into blender and puree. Fill glass with plum mixture. Cocktail version - add a shot of vodka, rum or cognac. Dip the rim of your glass in corn syrup, then in granulated sugar. Fill the glass half way with white grape and peach juice cocktail. Add a splash of pineapple juice. Fill glass with lemon lime soda. 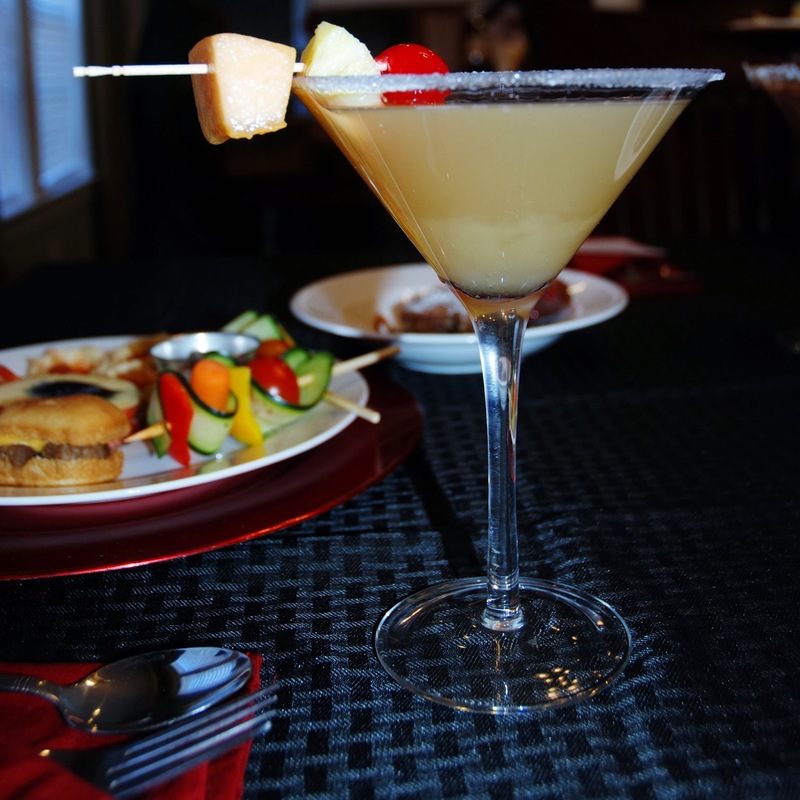 Garnish with a cherry, pineapple and melon skewer. Cocktail - add a shot of rum, vodka or Peach Schnapp's. Now that you have seen my devilish concontions I would love to know, which Disney character would you create a signature drink for? Now, give us a recipe. Have a Magically Villaineous Day!! Oh man Donna! I wish I went to your party! These mocktails sound delicious! I would definitely go with Grimhilde's or Mother Gothel's drink! I'm not a coffee/ mocha fan or a plum fan! If I created a drink I'd have to go with something strawberry based- maybe for the Queen of Hearts! I like that idea Beth. Maybe a pina colado with dripping strawberry sauce. Something like trying to paint over the WHITE roses. Great idea Beth!! Love the Queen of Hearts - and strawberries!! Oh my! Your mocktails sound delicious! I need to try these recipes for my party!! It was fun, afterwards you always think of ways you could have made it better - like the grenadine to make the sugar look like blood. Cannot wait to see your party!! Wow these sound good and how fun to drink at a party!! I may go with the Youthful Glow. Thanks for sharing! Thanks Sean! That is a punch I use at a lot of our parties, it's pretty good. Those drinks are to die for! I love all the creativity with the glasses too. I made a Golden Mickey punch for ours, but it was not as fancy as your concoctions. Great job! Thank you!! My sister & I had a great time putting them together. Your party was fabulous Lisa!! I love that you had a villain theme and even better villain themed cocktails!!! You are so creative! Queen Grimhilde's Poison Punch sound amazing! Three things I love all mixed together! Thanks for sharing! I can't wait to give it a try! I would love to know what you think Lin. Enjoy! Neat party idea! What was your favorite one of the drinks? 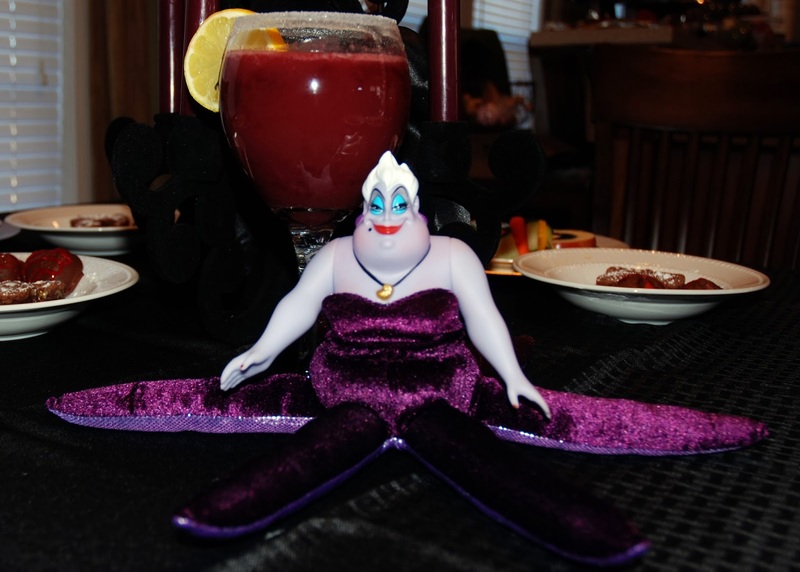 I love your Mocktails, they all sound delicious but my favorite is the Mother Gothel . Thank you for sharing the recipes! I'm certain these will be flying around the web!